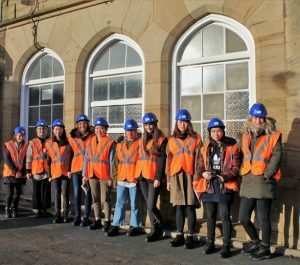 Final year students on a degree course at Northumbria University are hoping that their design ideas to revitalise Morpeth’s Victorian railway station can help them win a prestigious national design competition. 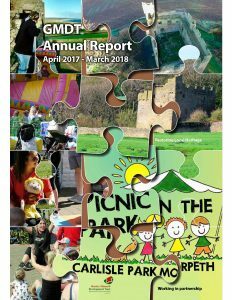 The responses are expected to be varied with consideration of graphics and wayfinding, inclusive design and commercial interior or product design to name a few. not only meets the needs of modern travellers, but its empty offices can be converted to accommodate up to 7 budding businesses in an enterprise hub, is an ideal case study for the students’ competition entry says Interior Design Senior Lecturer, Dr Julie Trueman. “We have selected Morpeth Station for this hypothetical project as it has the perfect mixture of disused or under-used historic buildings, potential for consideration of the underpass, platforms, waiting areas and approach paths and the possibility for the design to engage with a vibrant, close-knit community,” said Julie. 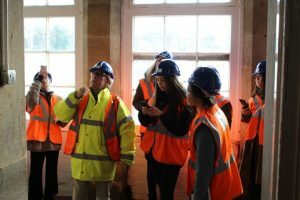 “A vital part of any ‘live’ project is the opportunity to conduct primary research and we are grateful to Greater Morpeth Development Trust (GMDT) and their contractors STP Construction for inviting us to visit the station now that work is underway. To see areas of the station previously closed off as well as having an explanatory tour will be invaluable for our students in their development of a cohesive concept design, aligned with the practicalities of creating a viable outcome. l Growth Network and track and train operators Network Rail and Northern. As well as the repair and modernisation work the station will benefit from a new ticket office, a café/restaurant and improved toilet facilities. Its distinctive portico entrance will also be restored, as will several historic tall chimneys which give the station its characteristic look. Work is expected to take about a year to complete. Morpeth Railway Station dates back to 1846 when it was designed for the Newcastle & Berwick Railway Company by the noted architect Benjamin Green. He, together with his father John, was responsible for many North East landmarks including the Theatre Royal, the Literary and Philosophical building and Grey’s Monument in Newcastle, Penshaw Monument and the railway viaducts at Willington and Ouseburn. Morpeth Station is the last of the railway buildings he designed along the East Coast Main Line, that still has passenger facilities. GMDT Chair, Doug Phillips welcomed the involvement of the Northumbria University students. “We are excited by the prospect of revitalising Morpeth Railway Station and I have no doubt there will be some interesting design concepts and imaginative ideas put forward by the students, which might be able to be incorporated into our own future plans for the station,” he said.